A dog isn’t just a pet. It is a member of the family. 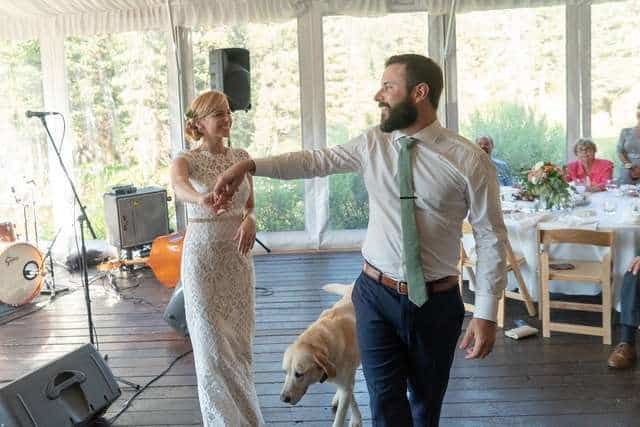 When you get married you want your friends and family to be there to celebrate with you, so it only makes sense to invite your dog too. 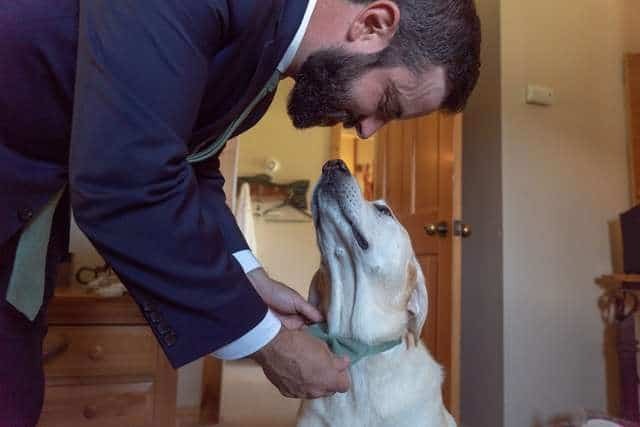 But you usually don’t expect the dog to steal the spotlight on your big day. Jayce Conway got his beloved Labrador, Boone when he was just a puppy. As he has grown, Boone and Jayce have become the best of friends and go everywhere together. Boone basically goes everywhere that I will go. He would wake up with me at 4:30 in the morning, ride with me to work and then he would ride around on my golf cart with me all day while we managed the golf course. 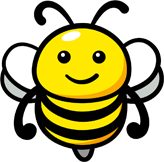 After five years of a long distance relationship, the happy couple decided they couldn’t bear it any longer and decided to get married. 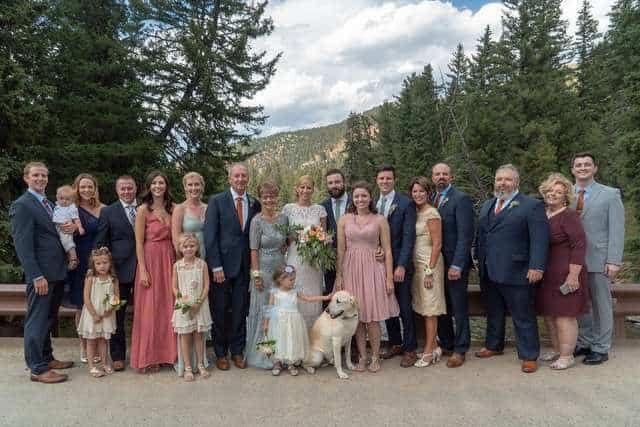 When they were planning their wedding day in Big Sky, Montana, they knew that Boone would be a part of it. 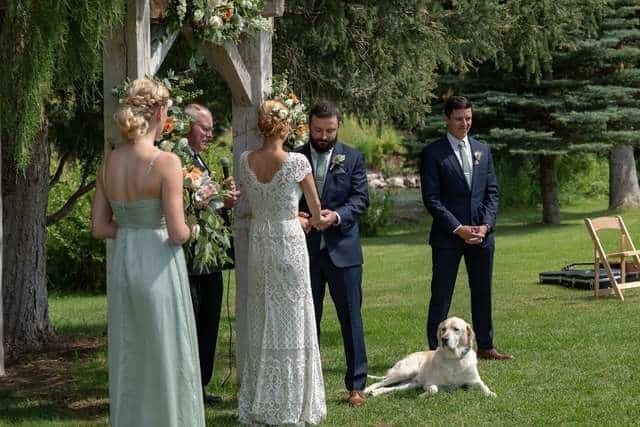 While most people may have their canine companion as the ring bearer, Jayce knew better than that. I didn’t want to tie any rings on him. He is very well-behaved, but he cannot resist water, and we got married about 7 feet from the river. So I just kind of had a nightmare about him running in the water with rings tied to his wrist or something. So his only role was to stand there next to us, and pose for pictures. 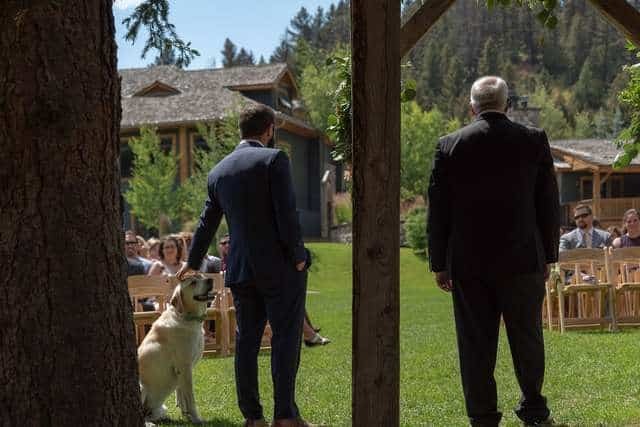 On the big day, Boone stayed by his best friend’s side throughout the ceremony. But Boone wasn’t prepared to give up his chance at being the talk of the wedding. During the opening prayer, Boone moved forward in front of the happy couple and laid down. He then proceeded to roll around in the grass, much to the delight of everyone at the ceremony (including the pastor). 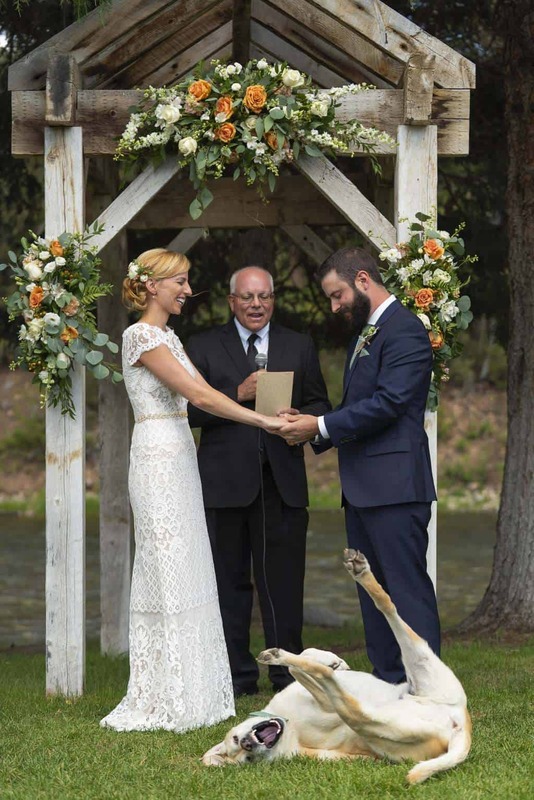 The best part though is that the wedding photographer managed to capture a fantastic shot of Boone mid-roll. The resulting photo is hilarious. We bathed him and cleaned him really well the night before, and sometimes dogs just don’t like smelling like fragrant soaps, so they try and mask it. He pulled that same move in the rehearsal also, so I guess we kind of knew it was coming. When the wedding photographer, Chris Davis, sent them the photo shortly after the wedding, Angie uploaded it to Facebook. Little did she know just how popular the photo was about to become. I shared it in a private Facebook group that we had created for the wedding, and then the next day, Angie made it her profile picture. My sister shared it, and then one of her friends [who] worked for KSDK [News] in St. Louis [saw it]. KSDK News asked if they could publish the photo and the happy couple didn’t think much of it. They gave permission and then set off on a drive to Zion National Park in Utah. We thought it would be a local fluff piece … and then we basically went into no [cell] service. We didn’t know what happened … and by the time we were able to get some messages through, it had already been shared like 40,000 times just since St. Louis, and that was in like 12 hours or something crazy. From there, it just took off like wildfire. Jayce and Angie can’t believe just how many people are obsessed with the funny photo. Their small intimate wedding has now been seen by 10 million strangers, all thanks to Boone’s hilarious antics. The happy trio is now moving to Alabama to start their family life together and they can’t wait to see what life has in store for them. They’re looking forward to going hiking with Boone and they’re excited to live in the same state for the first time. It may not have been Boone’s big day, but he certainly stole the spotlight. This has to be one of the best wedding photos I’ve ever seen. 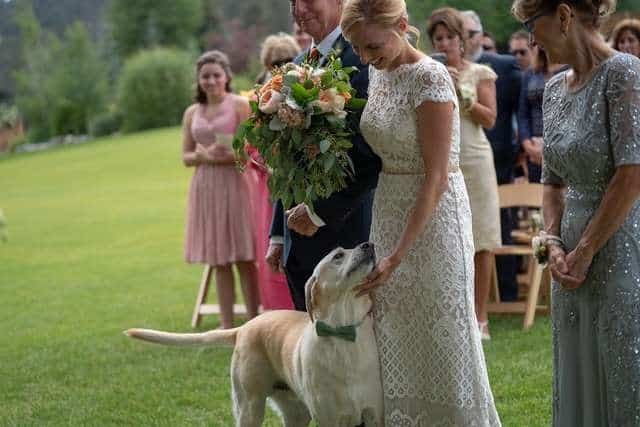 Dogs should be at every wedding!